A solid compound that contains water molecules in a defined ratio. A solid compound that contains water molecules in a defined ratio. Hydrated salts, such as hydrated copper sulfate, contain water molecules within their crystals. When the salt is heated, this water is released, changing the copper sulfate’s structure and appearance – from blue crystals to a white powder. This change can be reversed by re-adding water. These giant crystals, located deep underground in Mexico’s Naica caves, are made of gypsum – a hydrated compound of calcium, sulfur and oxygen. 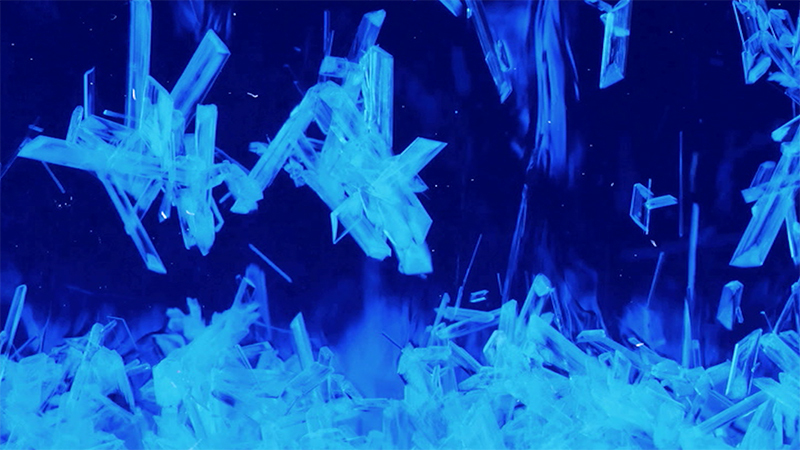 Hydrated salts, such as hydrated copper sulfate, contain water molecules within their crystals. When the salt is heated, this water is released, changing the copper sulfate’s structure and appearance – from blue crystals to a white powder. This change can be reversed by re-adding water. These giant crystals, located deep underground in Mexico’s Naica caves, are made of gypsum – a hydrated compound of calcium, sulfur and oxygen.